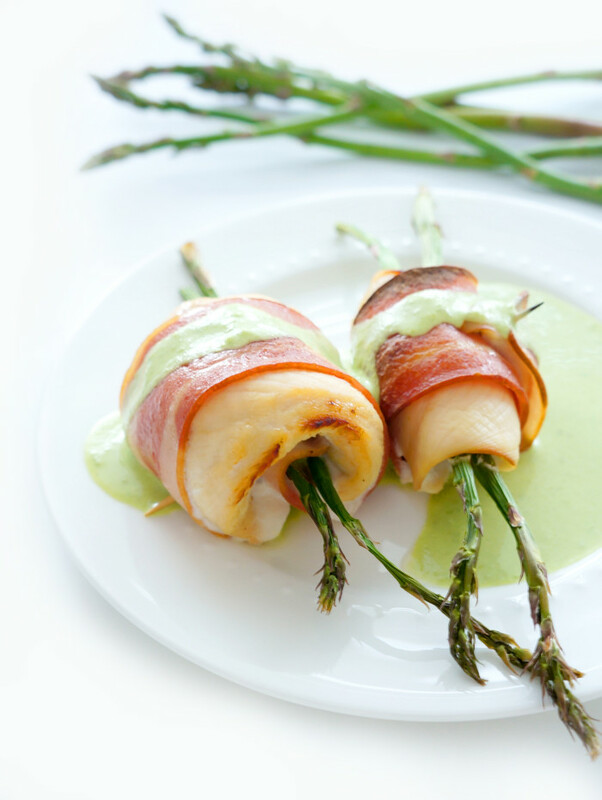 These chicken asparagus rolls topped with a smooth and creamy green pea puree are the definition of healthy gourmet food! They are super easy to prepare and are packed with flavour. Perfect way to impress your guests! These days I’m all about quick and easy meals. Even though I’m working a lot closer to home than I was last month, I’m still feeling the crunch in the evening to go to the gym, make dinner, clean up…..and maybe relax for an hour? Is that too much to ask? There’s just not enough time in the evening. Who’s with me?? 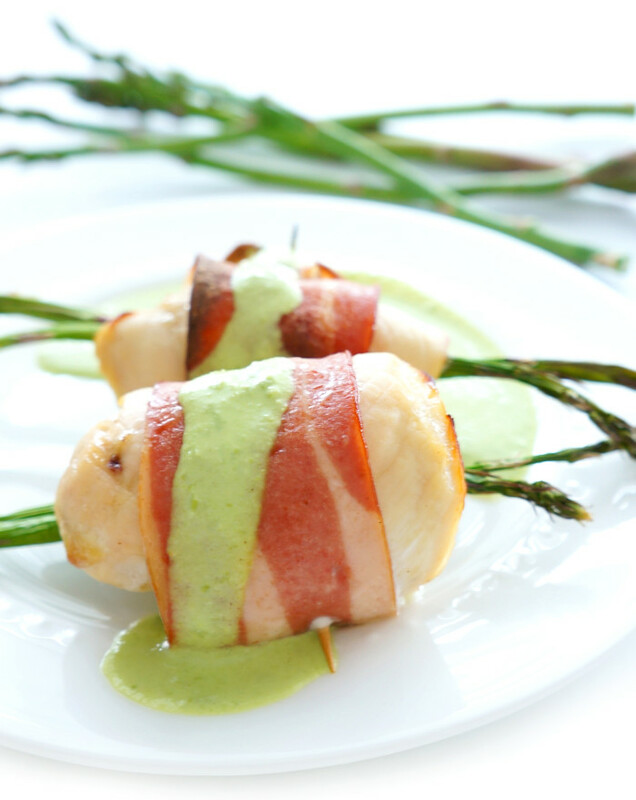 My latest easy recipe on the menu are these Chicken Asparagus Rolls. I’ve been making these roll-ups for several years now and it is definitely one of my favourite recipes. 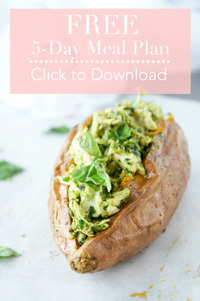 I love it because it looks like a gourmet meal, but really isn’t complicated to make at all! In fact, I pretty much have the recipe memorized. And that green pea puree?? Out of this world! It totally makes the recipe. I just whip up the puree in my little magic bullet. Super easy! If you’re ever looking to impress your guests (or your family) and have next to zero time to prep, I would definitely recommend this recipe! Cut each chicken breast into three equal slices lengthwise. In a large bowl mix together pepper, mustard and honey. Add chicken slices to the bowl and toss to coat the slices with the honey mustard mixture. Let it marinate for 25 minutes. In the meantime, cook peas according to package directions. Drain, and put them into a blender or magic bullet with the Greek yogurt and olive oil. Blend for 2-3 minutes. Stop blender before adding salt and garlic powder. Blend again for one minute, until the puree is smooth. This puree can be kept in the refrigerator for five days, and you can freeze it up to three months. Preheat the oven to 375 degrees. Wash the asparagus and snap off the tough ends. To assemble the rolls, lay down one slice of turkey bacon on a flat surface and place the chicken strip on top. Place one asparagus stick on the top of the chicken strip and start rolling it so that the asparagus is in the centre of the roll. Once the roll is ready, use a couple of wooden toothpicks to secure the turkey bacon—ensure the picks are placed in such a way the chicken strip maintains its shape around the roll. Bake rolls for 25 minutes, or until cooked through.